Do you want to START a geography club at your school? The NAYG is an organization of students across the country dedicated to advancing and expanding access to geographic education through the development of extracurricular programs. 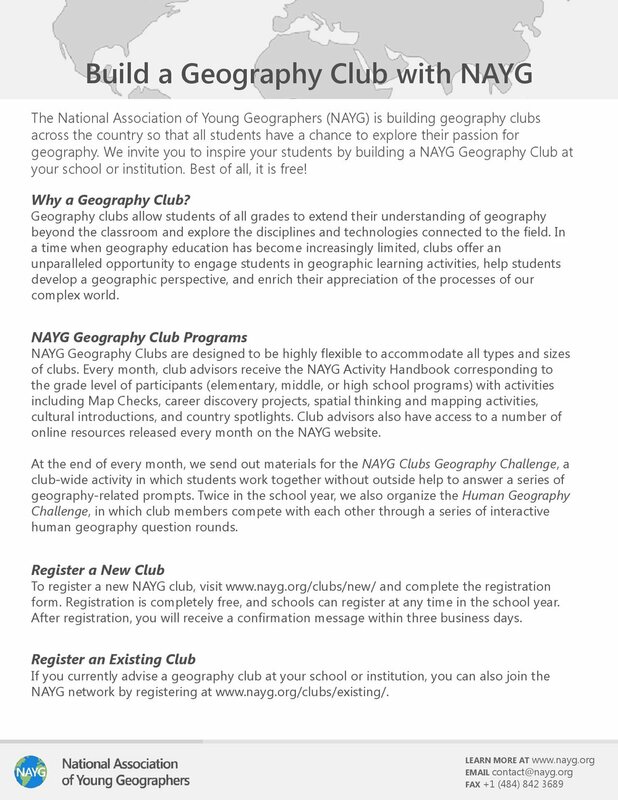 The NAYG is building a national network of extracurricular geography clubs in secondary schools, allowing students of all backgrounds to explore and cultivate interests in geography. Their aim is to introduce students to geography and its associated career disciplines through activities sanctioned by their clubs, including introductions to GIS, cultural activities, geography workshops, and the NAYG Geography Challenge, the national club tournament. Founded in 2007, Global Exploration for Educators Organization (GEEO) is a non-profit organization that has sent more than 1,600 teachers abroad on adventurous travel programs. With GEEO, educators can earn professional development credits and optional graduate credit while seeing the world. GEEO's trips are 7 to 21 days in length and are designed and discounted to be interesting and affordable for teachers. In addition to amazing tour leaders, many of the programs are accompanied by university faculty who are experts on the destination. The deposit is $250 for each program and then the final payment is due 60 days before departure. GEEO also provides teachers with educational materials and the structure to help them bring their experiences into the classroom. The trips are open to all nationalities of K-12 and university educators, administrators, retired educators, as well as educators' guests. GEEO is offering the following travel programs for 2019: Jordan, Iceland-Spring, Camino de Santiago, India and Nepal, Ireland, Paris to Rome, Bolivia, Vietnam and Cambodia, Madagascar, Tibet and Nepal, Greece, Iceland-Summer, Borneo, Ethiopia, Egypt- Summer, Central Europe, Peru, Multi-Stan, Sri Lanka and Maldives, Morocco, Mongolia, Bangkok to Hanoi, Galapagos Islands Balkans, and Baltics. Detailed information about each trip, including itineraries, costs, travel dates, and more can be found at www.geeo.org. GEEO can be reached 7 days a week, toll-free at 1-877-600-0105, 9 AM-9 PM EST.